Didn’t you get the memo? Volvo is no longer the preserve of accountants, history teachers and the perennially unstylish. The Swedish manufacturer is now the achingly hip kid on the automotive block and the new Volvo S90 R-Design is part of the proof. While the R-Design pack isn’t quite as hot as the full-blown Polestar versions of the old S60/V60, the new trim level represents (dynamically, at least) the top of the new ’90 Series’ range. 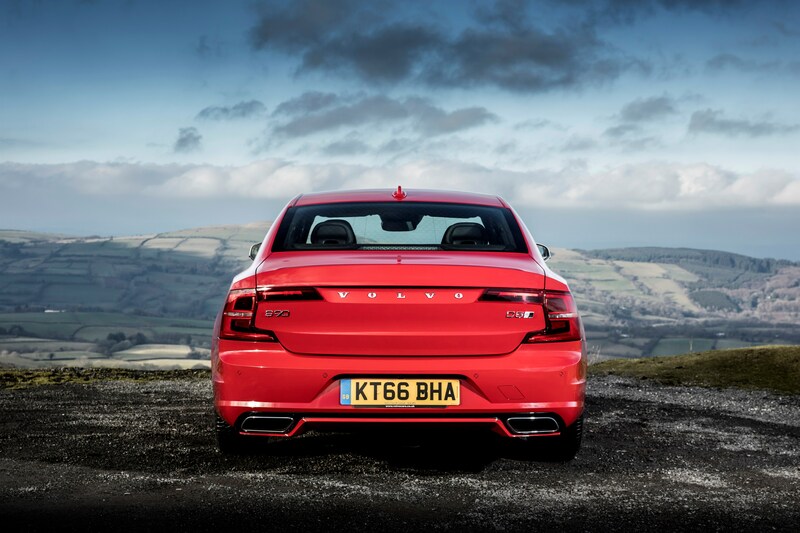 It’s expected to do quite well here in the UK too, especially in saloon-bodied S90 form. 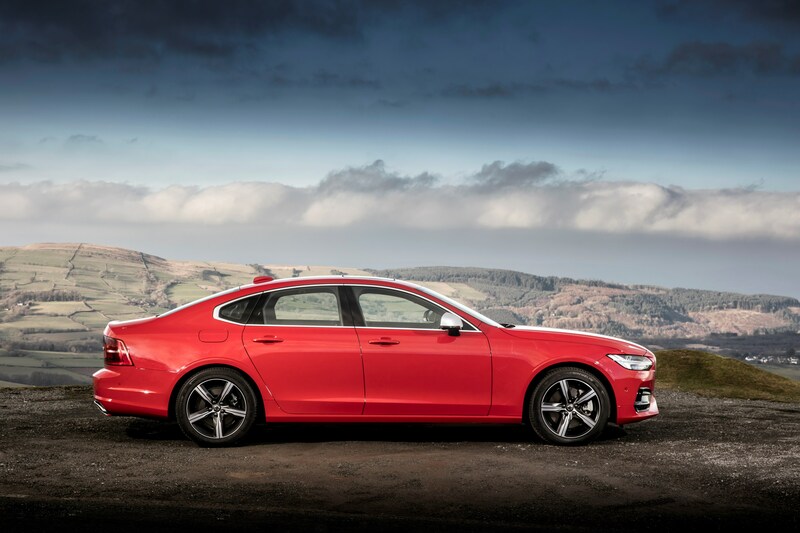 Volvo estimates that around 35 per cent of its luxury saloons sold on these shores will be in S90 R-Design spec. 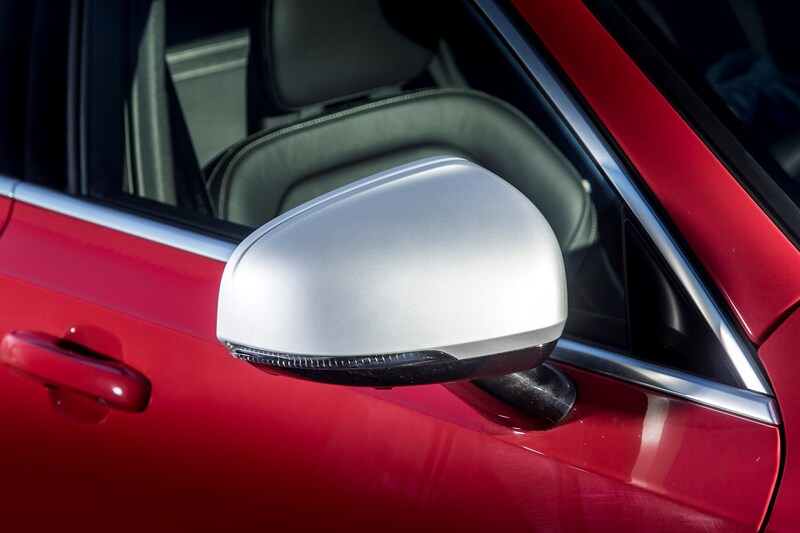 Aesthetically, the new Volvo S90 R-Design strays very little from the standard S90, keeping the same ‘hewn from solid granite’ shape as the base ‘Momentum’ and luxury ‘Inscription’ models. 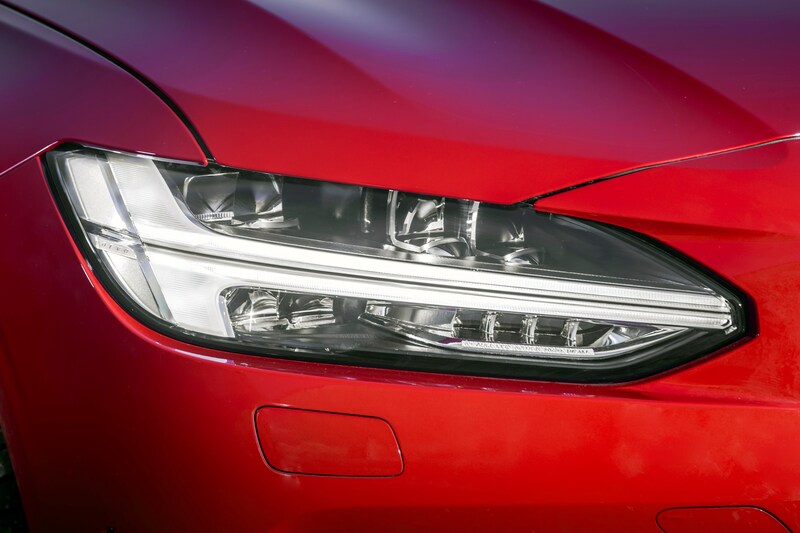 Instead, the S90 R-Design’s sporting pretensions are in the detail: there’s a unique gloss black grille, matt silver wing mirrors, twin trapezoidal tailpipes and a more angular, aggressive front bumper. The whole look is set off with a slightly more aggressive stance (thanks to a 15mm reduction in ride height) and a selection of alloy wheel options ranging from 18 inches to a frankly humungous 21 inches. SUV-suitable strides aside, it’s a subtle sporting style. If you’re looking for something as eye-catching as a Polestar Cyan S60, you’ll be left slightly disappointed. It’s a refreshing alternative to the usual myriad of be-winged and spoiler-ed sports saloons though. 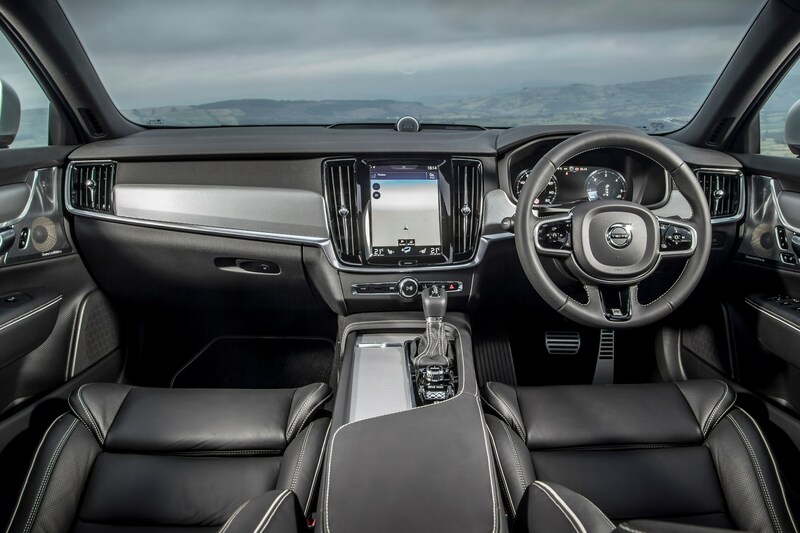 Inside, the Volvo S90 R-Design’s understated aesthetic (tasteful rather than tarty) continues with a smattering of perforated leather on the gear selector and special sports seats – once again sporting the Swedish flag for added Scandinavian cool points – and a bespoke metal inlay on the dashboard and door cards. As a place to while away the hours, it’s perfectly pleasant but the atmosphere is more ‘suburban commute’ than ‘Stelvio Pass’. Like the rest of Volvo’s ’90 Series’, the UK will only get two diesel engine options for the S90/V90 R-Design. The entry-level D4 powerplant provides 190hp and 400Nm of torque while the perkier D5 motor – coming as standard with four-wheel drive – develops 235hp and 480Nm from the same basic 2.0-litre architecture. 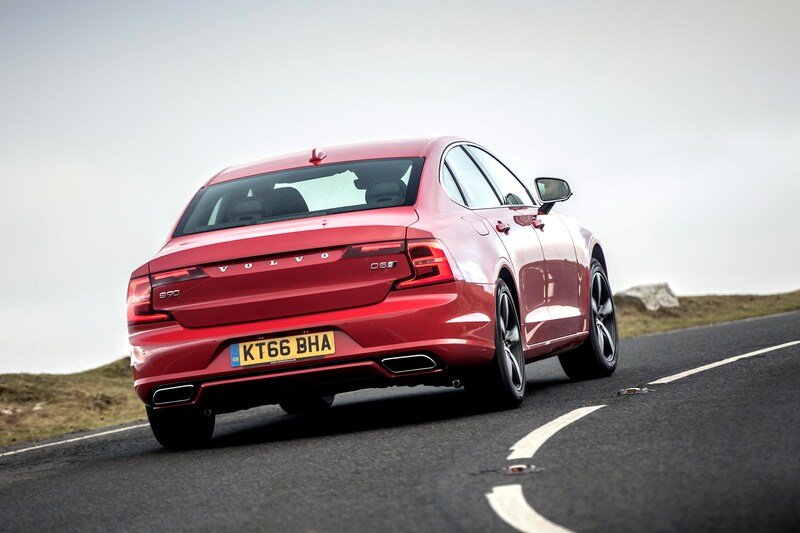 In true Flat-Out fashion we have plumped for the D5-engined Volvo S90 R-Design for our test and, complete with the brand’s PowerPulse technology, there is more than enough poke to get up to serious speeds with relative ease. Using a compressed air tank, the PowerPulse system is able to inject air directly into the S90’s turbocharger, spooling it up before you’ve even got on the throttle to help reduce the engine’s turbo lag. 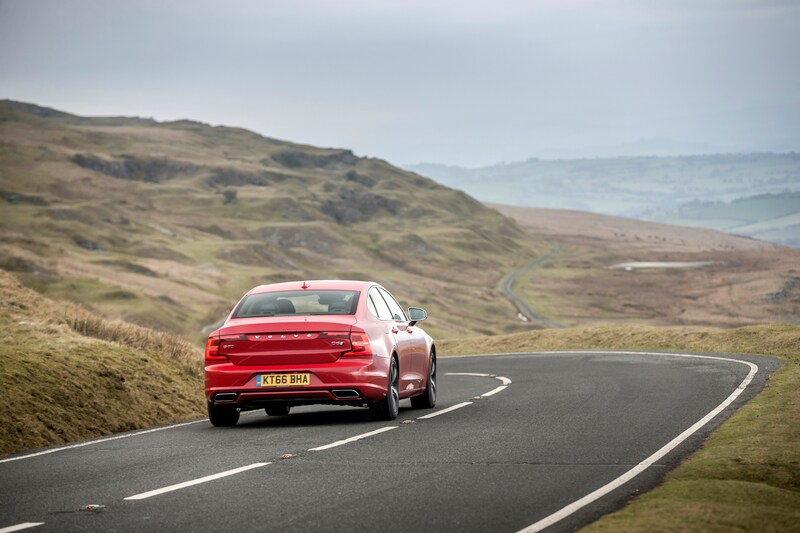 It’s clever stuff (we’ve come to expect nothing less from those smart Swedes in Gothenburg) and, while it doesn’t extinguish all the lag, the D5 has an incredibly linear surge through the rev range, taking you from nought to 62mph in a respectable 7.0 seconds. 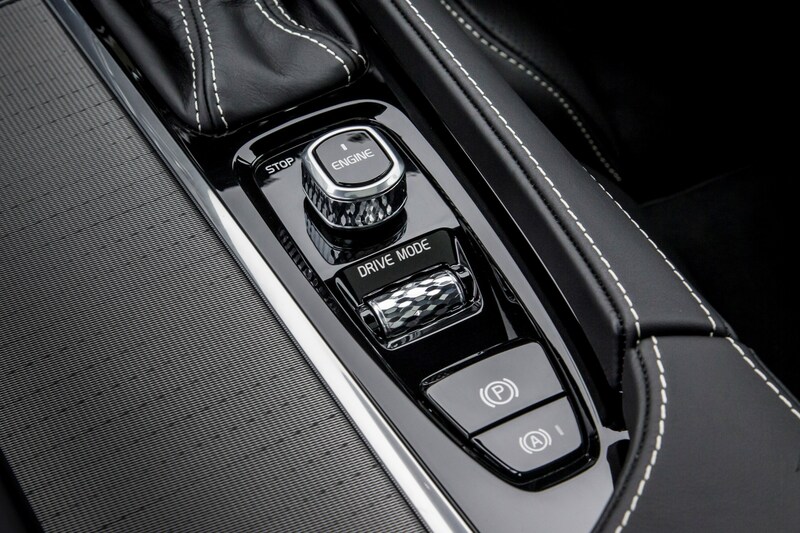 The eight-speed automatic gearbox (the only cog-swapper available on the Volvo S90 R-Design) is impressively quick to react to manual inputs, though the greatest compliment we can pay it is the units ability to blend into the background when left to its own devices. Our biggest gripe with the powerplant is the lack of refinement at the top end. Above 4,000rpm it becomes readily apparent that this isn’t a true performance engine, the distinctive diesel rattle permeating the cabin’s erstwhile serenity. You see, while the engine may not have been fettled for the R-Design pack, Volvo’s engineers did ensure that the chassis was tweaked to provide a few more on-road thrills. As well as the reduced ride height, the R-Design’s springs are stiffer, the anti-roll bars are bigger and the dampers are a faster-responding monotube design. 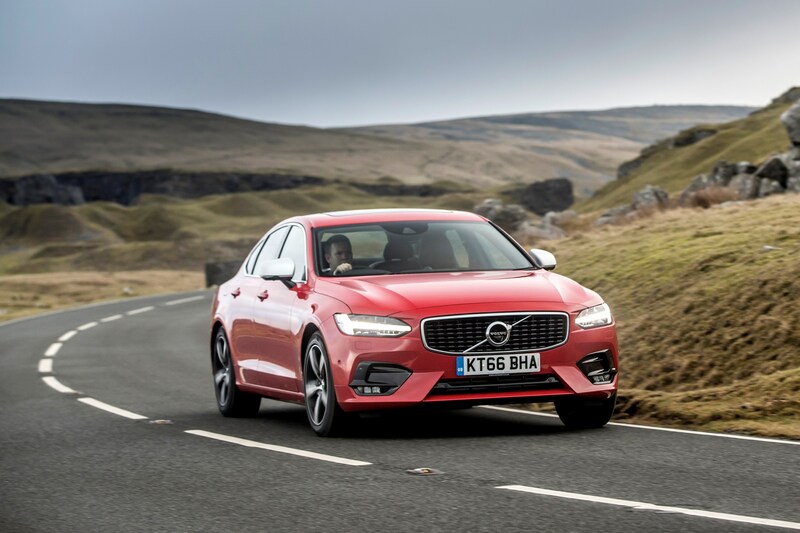 It all adds up to make the Volvo S90 R-Design a surprisingly swift cross-country chariot, chewing up our B-roads with verve. If there’s an issue it’s that those stiffer springs offer a little less cushioning over Britain’s tumultuous back road tarmac. Even in ‘Comfort’ mode, the S90 R-Design is noticeably crashier than its more luxurious brothers. It’s hard not to like Volvo’s S90 saloon (in any of its three flavours). The general build quality imbued in the ’90 Series’ has transformed Volvo’s offerings into a genuine rival to the German trifecta in the executive market. But it’s hard not to be left feeling that the R-Design lacks a little… pizazz. Maybe it’s the diesel engine (namely its lack of extra oomph over the standard models) or maybe it’s the understated appearance. It’s still a well-polished Swedish gem however the Volvo S90 R-Design seems to have an identity problem. It’s neither truly sporting, nor entirely luxurious, instead falling into the mire somewhere between the two. 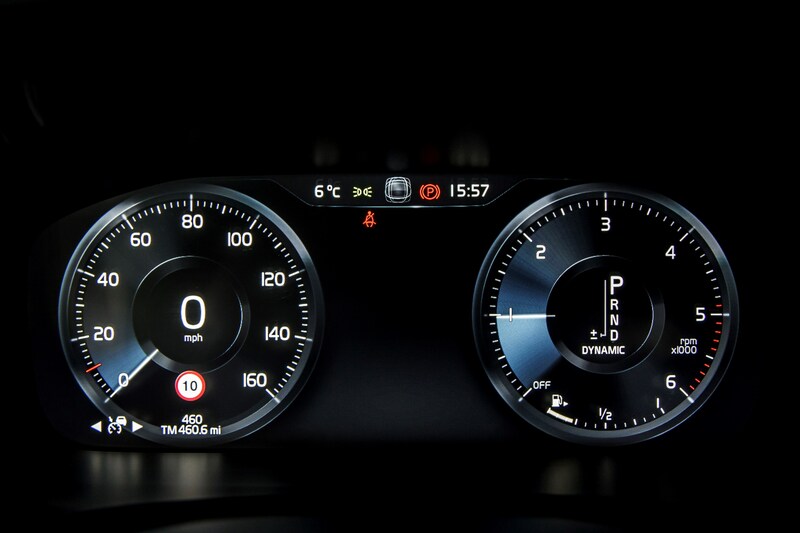 If you want pure Scandinavian luxury and style, you’re better off plumping for the Inscription while, if out-and-out performance is more your thing, hold your horses until a Polestar version arrives (or, at the very least, the hybridised T8 version, complete with 412hp). Maybe then the R-Design will make a bit more sense.